Learn to Cro-Tat, Annie's, 2016. Includes hook with rings on the shaft to help measure picots plus instruction book with three projects to make with size 10 cotton thread. Brand New 2016 Release! 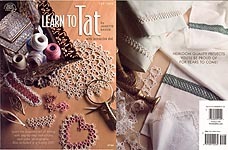 Learn To Tat, by Janette Baker, American School of Needlework, 2008. 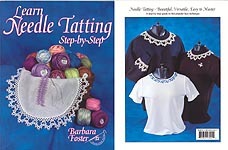 Step- by- Step instructions, color photographs, and an interactive DVD included for Beginning and Advanced Tatting Classes. Projects include edgings, Small Butterfly, Heart, Bookmark, Daffodil Doily, Star of David Table Runner, Josephine Ring Edge, Spoit Ring Chatelaine, Tat & Crochet Edge. BRAND NEW! 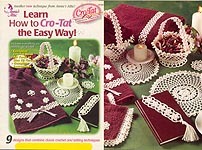 Learn How to Cro- Tat the Easy Way, designed by Elizabeth Ann White, Annie's Attic, 2001. 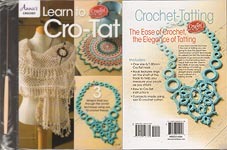 Combines classic crochet and tatting techniques; full how- to plus 9 projects: Basic Flower, Coaster, Bookmark, Towel Set, Doilies, and Baskets. 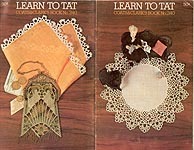 Learn To Tat, Coats & Clark's Book No. 240, Coats & Clark's Sales Corp., 1974. 35- page digest- sized book with how- to diagrams and step- by- step instructions. Projects include Edgings, Place Mats, shade pulls, a Bible Marker, Pillow Top, Doily Edging, and Doilies. Some cover and page wear, but overall good condition. A Coats Publication Book No. 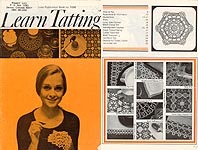 1088: Learn Tatting, designs created by The Needlecraft Design Centre, Glasgow, J & P Coats Ltd, 1971. Printed in Great Britain. Illustrated step- by- step instructions plus patterns for Doily, Long John Runner, Motif Cheval Set, Handkerchief Edgings, Guest Towel Edging, Coffe Table Mat, Motif Traycloth, Luncheon Set, Edgings for Trolley Cloths, Lemonade Set. Some cover and page wear, but overall good used condition. An Introduction to Tatting, Verlag Aenne Burda, 1980. Illustrated instructions for working with one or two shuttles and reading diagrams. 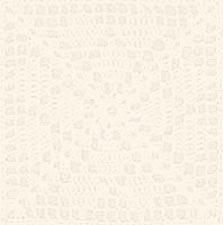 Four sample lace edgings included. Very good condition.